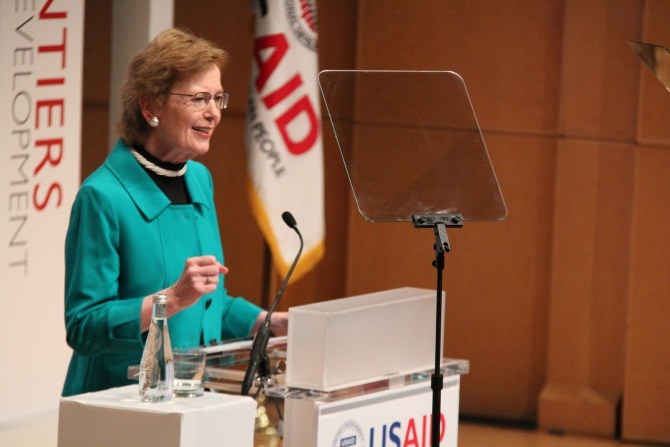 Mary Robinson delivered a keynote address at the USAID convened Frontiers in Development on Friday 19 September 2014 titled Climate Justice – A New Frontier for Development. The Frontiers in Development Forum was a major development event. The second Frontiers in Development Forum which took place over 18 and 19 September engaged a dynamic community of global thought leaders and development practitioners to address the question: How will we eradicate extreme poverty by 2030? The Forum participants were convened to discuss ending extreme poverty, and lay the groundwork for a broad coalition of partners committed to this goal. Other speakers on Friday 19 September included US Secretary of State John Kerry, Justine Greening, UK Secretary of State for International Development and Graça Machel, Founder, Foundation for Community Development, Mozambique; Founder, Graça Machel Trust.